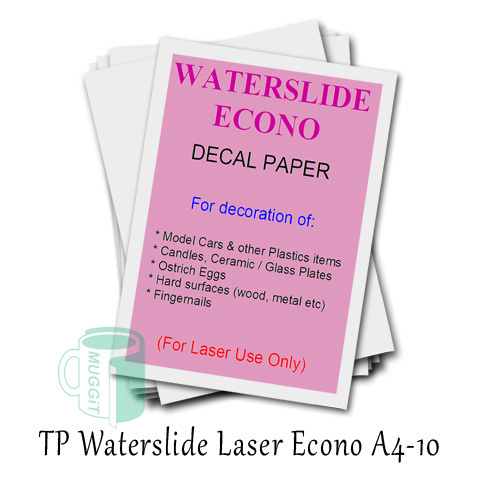 ECONO Clear waterslide paper A4 for Colour laser printers and colour copiers only. For use with Laser. This paper is thin, be gentle with it. Only use a tissue to press the water out of it. Waterslide HT (High Temp) Transfer Media is used for Transfering to Heat Sensitive materials and/or materials without Flat Surfaces. The application is different than with CMYK printers. Due to the fact, that the White Toner is printed as last on top of the colored toners, the Waterslide HT transfer media can only work as a 2-Paper-System. The design is printed on the A-Paper and the A-Paper is then pressed together with the Waterslide HT media under heat. After the seperation of both papers, the toner transfers to the Waterslide HT media, which brings white under the colors. A more advanced and Heat-Resistant product, that can be used with even the fastest working printers. We have developed a more advanced and Heat-Resistant product, that can be used with even the fastest working printers. Our well-known Waterslide Transfer Media for printing on Heat-Sensitive and Uneven Surfaces, such as: Candles, various Model-Making applications & Ceramics – Is now available with improved formulation for printers and photocopiers with high fixing temperatures! For this reason, we have improved our standard Waterslide media by adding an additional HT (High Temp) coating. Not only has this removed all previous issues associated with the old Waterslide media, but has increased the range of new Laser/LED printers that are compatible with the new Waterslide HT transfer media. The overall improvements have left us with a more effective product that is of the highest quality.